Certified organic bedding is free from the chemicals, artificial dyes, fire-retardants and bleaches commonly used in manufacturing regular bedding. From your mattress to your comforter, blankets, sheets and pillows, it's possible to put together a complete set of organic bedding that just might help you rest easier at night. When shopping for organic fabrics, you want to be sure the material is 100% organic, not to be confused with those marketed as 100% natural. Organic products will bear the Organic Seal of Certification. Cotton or wool can be all natural and yet not be a certified organic fiber. Dual chamber buckwheat hull pillows: Inner chamber filled with organic buckwheat hulls and outer with organic wool. Customize firmness by removing buckwheat. If you want the look of a boutique hotel for your boudoir, this company is your final destination. With multiple brick and mortar locations throughout Canada and the United States, Loop Organic sells organic bedding guaranteed by the "most stringent set of standards for organic textiles (GOTS)." The company is also a member of the Organic Trade Association and Green America. Obasan, located in Ottawa, Ontario, offers a full bedding system that includes box springs, mattresses and pillows as well as comforters. Comforters: Made from organic wool that's "quilted between the organic cotton covers"
Crib mattresses: Extra firm support in pure wool or pure rubber; covered with "removable organic cotton jersey"
According to the Rawganique website, the owners specifically chose the types of fibers they wished to sell. "We settled on three elegant ancient fibers: organic cotton, hemp, and linen." They also stipulate that all of their products are 100% organic, sweatshop-free and hypo-allergenic, dye and chemical free. You can choose Rawganique's EcruCannaBliss Chambray Home Collection bedding or other bedding made from 100% certified organic wool, as well as custom pillows made of organic mullet, buckwheat and flax. What you find with The Mattress and Sleep Company is an organization that "is passionate about chemical-free bedding, mattresses and bath." While a large selection of 100% certified organic bedding is offered, there's also "all natural" products offered, so check the descriptions to ensure you end up with organic bedding. Organic Lifestyle is located in Toronto, Ontario, although you can make purchases in-store as well as online. 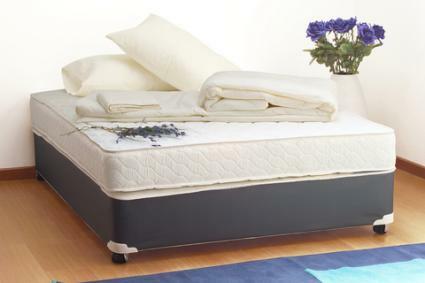 The store specializes in organic bedding manufactured according to the standards used by Oeko-Tex. Dream Designs does sell other products listed as "natural," so be sure that the bedding you're looking at is listed as 100% organic. These are just a few of the companies in Canada that offer organic bedding. When you buy your bedding, you can rest easy that you've made a healthy choice that promotes sustainability. Many eco-minded shoppers look for more than just a product and want to support a company dedicated to a "green" lifestyle. Many of these companies go this extra green mile by supporting various green initiatives, eco-friendly organizations, and other organic efforts for a sustainable lifestyle.